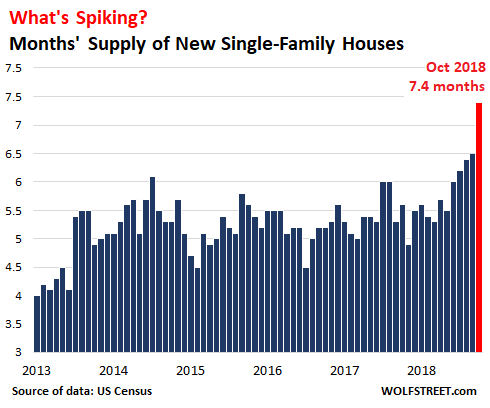 In fact, 7.4 months of supply of new houses was the highest since February 2011, during Housing Bust 1, the first housing bust in this millennium. The chart below, going back to 2004, shows how months’ supply clearly identifies the trajectory of Housing Bubble 1, with about 4 months’ supply or below during the upward price surge through 2005. But then, as prices were turning south, the hyped “shortage” of homes suddenly turned into a flood of homes, and contributed to the unglamorous bust in prices. Trouble in the land of new houses hasn’t been exactly a secret. Since January this year, the stocks of home builders have gotten beaten up, after a phenomenal post-election rally that had kicked off in November 2016. Homebuilders are the pros in the housing market. They have the data, they know what’s going on in the market. And the market is where the buyers are, and the buyers have lowered their aspirations as their home-purchasing power is being whittled down by rising mortgage rates. To make sales happen, homebuilders’ first reaction is to throw incentives at potential buyers to get them to sign the deal, such as an upgrade to granite counter tops. But those incentives are hard to capture in overall pricing data. And that’s precisely why incentives are being lavished on buyers up front, rather than price cuts. If incentives are not enough to move those houses, prices come down. And that has been happening. These lower prices of new houses are pressuring prices of existing homes further. That’s what happened last time. And now it’s starting to happen again. ← What’s Behind the US-Saudi Nuclear Mega-Deal? Based on the inventory rise in the last bubble, it looks like we are headed for about 9 months of inventory this Spring, and back up to 12 months supply in 2020 or 2021. Of course, the early listers that are also motivated to sell will capture the highest prices. Many of the listers will follow the market down for years. This time around, though, household debt is higher, so we could be looking at higher inventory levels than the last bubble, which never really ended and simply expanded. because a lot of people we be upside down on the mortgage, unable to sell but still employed. I’d look for a long stagnation in home sales as prices drift lower. In the last bubble in my neighborhood where builders were offering new homes, I saw prices drop really fast. In a matter of months, the builders were asking 15% less. A couple months later they dropped another 15%. Then they started a slower decline for three years. It started in Fall 2007. Hard to say if inventory will beat last bubble, but prices are falling hard and fast, and inventory is exploding, just like last time, so far. I’m asking myself, why would anything be different when the bubble is much bigger and has spread to many more asset classes. The problem is not people ending under water with mortgages: the problem is all the supply coming onto the market. It’s beyond crazy and besides the projects which have gone too far to be stopped there are many many more already approved or halfway there. If I know smaller banks, they’ll keep on greenlightning loans to developers until it’s far too late, meaning until the goose laying the golden eggs has not been merely killed, but plucked, gutted, marinated and cooked to a crisp with a nice side dish of baked potatoes. And when developers will start going underwater one by one under the weight of their unsold inventories, we’ll have some old fashioned fun. Just bring some earmuffs because the whining could seriously damage your hearing. How much profit margin do the big builders have? There has to be a good amount of wiggle room. I’d guess land acquisition cost is really the main expense? Gross margins for large developers in the present environment are in the 20-15% range. I am not an expert on real estate and a well-known opponent of speculation (though my crusades always end the same: with me moving to a place where speculators will soon catch up with me) but I’ve been told that anything below 15% gross margin means these people are making very little money, or at least less money than their usual. One typical pattern I’ve noticed is that when gross margins start going down one of two things happen. The original developer will progressively slash workforce until he gets to a bare minimum, even if this means serious delays in the delivery: this is usually a sign pre-sales are not going well. Banks aren’t happy but they are usually already so deep in the project they cannot do anything about it. Or the big developer who is smelling troubles sells to a smaller developer who can either get by on paper-thin margins or (more often) thinks he can. Slowly raising rates will eventually end up slowly boiling these particular frogs alive, much to my amusement. So, are we now at the stage 1 of addressing the affordability crisis? I think the implication here is that eventually prices will have to come down, because if new housing price drops, then logically it will start to pressure existing home prices. Right? Because at the end of the day, you still have to sell when you have to sell. This is ominous. A rollover in New Home sales, if not corrected quickly through price reductions, translates to reduced employment not just for builders and their suppliers, but for a large slice of the economy through knock-on effects. Between this, the auto industry cutbacks, and the slackening of demand in high tech (FANGMAN and semiconductors generally), we could be looking at the beginning of the next recession. 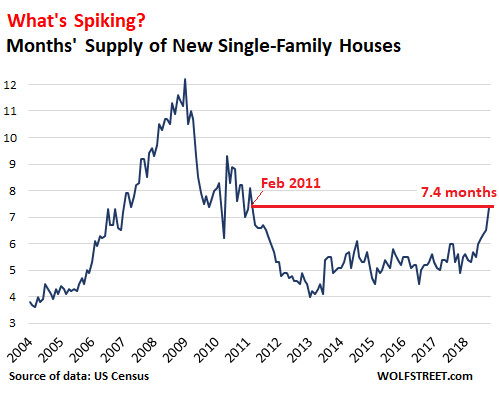 On the other hand, it’s only a blip so far, and the new home sales rate is only about half it was at the peak of Bubble 1 (2005-ish), so the economic impact of a building slowdown will be less of a disaster for the overall economy. 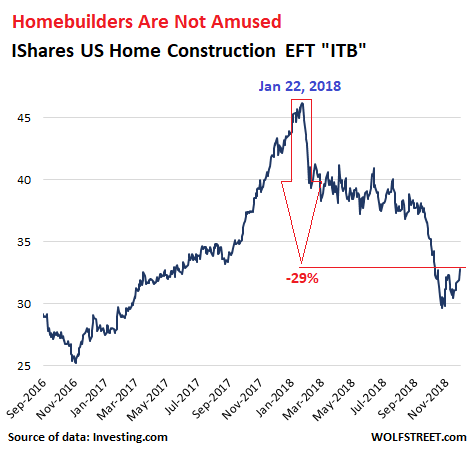 Also, the ITB housing stocks haven’t dropped nearly as far as they would if their investors thought a recession was dead ahead. So far they’ve just worked off the bubble-spike which began late last year. Of course, there’s the corollary problem of student debt dampening household formation amongst millenials. This is gonna break one way or another. Wut? No way it’s easy: hand back the keys. Can’t do that with a diploma. that’s it! I’m selling all my pulte, lennar and direxion homebuilders bull3X shares!! So much for the Fed’s independence, huh? This is inline with my expectation from the Fed. The stage is set. Pause hikes, Pause QT, Cut rates, do QE. Next up should be EU and BoJ. Economy is not about products and services any more. It is all about clowns who can conjure up money at will. 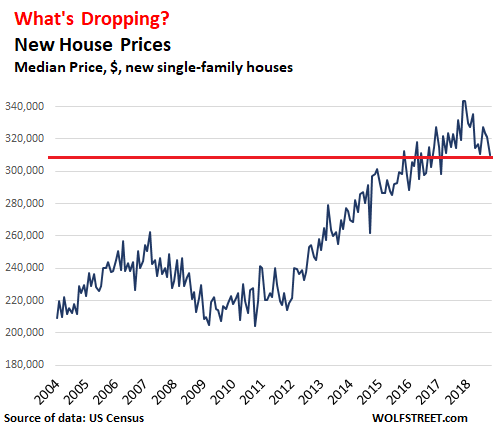 The question is does it fire up the home prices? Looks like the stock market is front running the pause today. Yep. Powell said the Fed does not see any bubbles! Therefore, stocks are fairly valued as are all assets and there is no housing bubble. So it is only logical the Fed and Powell will move to cut rates and more QE as needed. GM is going into debt $4 billion to close plants and do massive layoffs of trump voters, but only after $14 BILLION in buybacks and massive executive compensation. For 2017, GM CEO Mary Barra, got $22 Million dollars in compenstion, $14 Million of which was in stocks and stock options. Barra got a bonus this week in her pay, after announcing she will be firing 15,000 people, GM stock jumped 8% and this fed is worried about asset prices and corporate debt. Eveyone is a tech company now. GM and marry Barra want to be a tech company, not a car company. For example, GM’s plans for new revenue streams includes in-car ads, because you are not exposed to enough ads. – Rate hike in december ? Perhaps, but the 3 month T-bill rate told a different story today. It took a hit (although from a very high level). 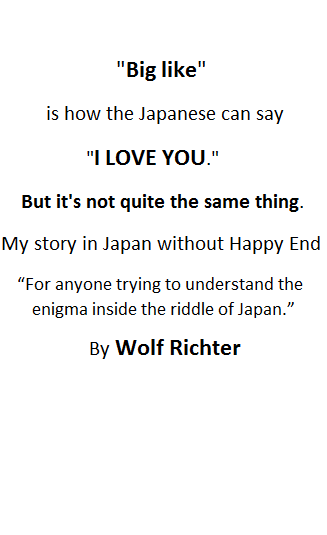 Thank you, Wolf. I’ve never read or seen that report before. Your blog is an ongoing education! To me, it reads as though the Fed is relatively comfortable with the elevated valuations in assets, only comparing current conditions to the near collapse in ’08-9. That’s small comfort imo. Interesting that there’s no reference of the Fed being completely asleep at the switch as the asset inflation and run-away lending took place from 2002 – 2008. And little mention of the new tariffs that are sure to drive up inflation – “trade tensions”. Respectfully, I don’t interpret what was in that report as the Fed being worried big time. It sounds as though they’re showing their vigilance but that things are copacetic. ZOMG OIL is at $50!! so the fed should worry about the oil services sector going into recession??? mr Bierce, you gotta be kidding me?? that’s your canary in the mine? that’s what you’re worried about? what’s the total value of the oil services sector, how many people does it employ? in a 20 trillion doelar eCONomy oil at $50 should not in any way shape or fashion be cause for worry visavis rising rates and dumping asset prices. In fact, that’s the problem! the problem is the oil sector, both prodxn and services would LOVE their asset prices to remain inflated. what am i missing here? how is a XES recession going to make my life worse??? i dont see how rasing rates in an environment where oil is deflationary will cause a trade deficit and a “deflationary crash” and as far as the doelar is concerned, an argument can be made that on a global basis there is a dollar shortage; the euro dollar market is broken and in any case, the doelar has been “blown out” since 2015 and today it sits at 90% of its peak value in 2015 vs the yen on the 10 yr chart, same with the DXY sitting at 95% of its 2017 peak today. Wolf it would be interesting in an upcoming post to see the if there is a relationship between the home builders and the stock market going back before the last recession. The collapse in October sales explains why builders are offering double commissions, free trips and a host of other incentives. Anything to lure that “pent-up demand” would-be buyer into pulling the trigger and sign a contract. Builders were happy to ride the wave of artificial inflation on the way up. The mean reversion won’t be as much fun, but that’s the nature of a bubble. Homebuilder stocks were tanking this morning prior to the Powell speech that ignited a market short squeeze. A temporary respite, I’m afraid, in this new echo bubble. Only thing that’s going to save the housing market is lower prices, lower rates, or a combination of both. I suspect we’ll see both in due time. A “recovery” built on debt is not sustainable, no matter how hard the Fed tries to pretend otherwise. The carnival show continues. The Fed has to raise rates because they are knee-deep in a credibility trap of their own making. Chicken-or-egg first? Build a really nice road and businesses and houses will spring up. A lot of debt is going to be written off. Through inflation and write-downs and bankruptcies. Then new mortgages and business loans! Wow… long but fascinating analysis of recessions. Thanks, Weary. Fed Chairman Powell apparently signaled today that he’s caving to Trump’s pressure and the QE unwind may not go far, now. The dtock market jumped 600 points, of course, and maybe the loose-money tycoons will buy more houses to rent out to the debt slaves. Housebuilders (not “home builders”. Families are home builders.) will go from not pleased to pleased, overnight. I am replying here just once to all the people who are believing Wall Street propaganda regarding the Fed. Wolf has linked the full text of the latest Fed financial report above: it’s a veritable task to read and digest (I pity the poor intern who had to put it together using that verbiage) but it’s available to anyone with an Internet connection. Apart from the fact I am a few brain cells poorer, I don’t see any hint in it of another QE or whatever. Financial publications will go to incredible lengths to push their own version of a story: for example it has been said for weeks now that Icelandair “bought” rival low cost carrier WOW Air. And the reality is completely different: while the Icelandair board has approved of the deal, the shareholders have so far refused to approve it because they fear taking over a company with such a precarious financial position. Mr Gudnason, the Icelandair CEO, has called for another shareholder meeting tomorrow to try and get approval, but conceded that if shareholders remain opposed he will be forced to scuttle the deal. Who had an interest in “selling” the Icelandair-WOW Air marriage as a “done deal” instead of reporting the difficulties the deal faced? I am not pointing any fingers but there are more than a few. Anything the Fed does is several orders of magnitude larger than an airline takeover, so you can well imagine there are many more persons interested in presenting what they wish for the story to be instead of the “raw deal”. That financial Stability report Nov 2018 seemed to be very on target, but their actions are not following their words. I realize Powell is in a difficult position politically, but he basically caved in. The Fed Put #2 via Powell will really bring the fixed income market to it’s knees,even though it’s already there. There’s not much play with the FFR this time around. QE4 or 5 (? I’ve lost count) would add to the 4 trillion already on the books. The stock market is becoming more and more dependent on a monetary policy that’s losing potency over time. It’s become a game of chicken and speculation, and everyone kind of realizes this. Where I live a brand new garage costs about $309,000. That’s about $270,00 overpriced from my market. Do you reside on Venus? True not just for housing but for classic cars, motorcycles, art – you name it. No wonder people of a rational bent (i’ve heard there are some still out there, but they’re an endangered species who need tracking down and crushing with debt) are starting to feel a bit ‘cuckoo bananas’! Well said! That is it in a nutshell. It is all about Funny money. Capitalism without proper pricing of capital is NOT CAPITALISM. The sad part is the effects do not manifest for a generation so the person responsible for the damage happening will feel like King Kong during that period (remember Alan Greenspan!) and the one who are being damaged will feel great (home price exploding-I am NOW RICH) without realizing that generations to come are screwed! I don’t know where (The Real Tony) lives but what he’s describing sounds like what I see here in greater Seattle. Small house with a garage underneath that looks like an apartment over a garage but the home part is also 1st floor (in back of the garage).. Postage stamp lot. $309,000 is about right.. depending how close to the city.. Intown, add more to that price.. This is why I left Seattle to return to flyover country. It’s the lot value that’s gone hyperbolic, not the cost of construction. It’s about $125 sq ft. and hasn’t gone up all that much in 10 or so years. Wolf if you want to interview someone interesting then the person who runs analytics.miami is interesting. There is a ton of inventory on the market there and prices are down 30% in upmarket areas. I dont think a slowdown in housing will cause a recession and if anything the US has underbuilt the last 10 years. That is an interesting opinion. My take on it is that we have had extremely low building anywhere that is within 50 miles of the Pacific Ocean, and grotesque overbuilding in places like Vegas and Dallas. I wonder what it would take to have a few million jobs move from, say, Seattle to, say, Omaha? Failing that, we are going to have a two-tier housing market for another generation. – In Australia there are some 80,000 empty dwellings, some 120,000 dwellings are under construction. If all the plans for building more dwellings are approved then the australian housing market will have to absorb another 80,000 dwellings in the next say 8 years. Ouch. Not a pleasant (future) outlook. – Some people have pointed out that if one wants to find out what the genuine demand for houses/dwelling is then one should be looking at the development of rents and not of homeprices. And those rents are falling, in a number of cities here in the US. – Even in Miami there are A LOT OF empty apartments/dwellings. It will be interesting to see what happens to all those empty apartments when the housing market turns sour in Miami. Some say that these dwellings are bought by people from (e.g./especially) South America. 90% of Silicon Valley jobs pay less than they did a decade ago. What could POSSIBLY happen to their incredibly overpriced housing market? Ironically-ish, I think this is one of the things that props up RE in Portland, OR. I feel like our tech boom is the overflow of SV and Seattle. Companies can get the same talent for less by setting up satellite offices here. Still seeing big RE price drops and long listing times, though. My daughter is 25, and many of her friends are simply not interested in buying homes—and especially not the traditional higher maintenance homes my generation enjoyed. They need and want to be mobile, and most often both work, and they don’t have the time to spend on home care. I don’t ever see the changing buyer discussed in articles about the home market. Also, our town is like many already discussed here—building apartments and cheap condos hand over fist. Our market is flooded with options, and I’d hate to be trying to sell a non-mainstream home right now. Nothing will change until reasonable down payments are mandatory on all loans.. imho that alone will keep housing prices in check with reality…. Folks that only have a few thousand dollars of hard work and sweat in the game, could care less… Human nature vs greed…. Chicken or the egg? ..